Here is an article and plans that I electronically scanned from my purchased copy of the January 1970 American Aircraft Modeler magazine. Because they span two or more pages, I had to adjust the size and alignment a bit to get halves to line up properly. You might be able to scale up this image below, but if you need something larger to begin with, please send me an e-mail and I will send you a 4.5 x 3.0 kpixel version with readable text. It will be delivered as a file attachment to an e-mail, so your mail server must be able to receive a 4.6 MB file. Sorry, there is no FTP service available. 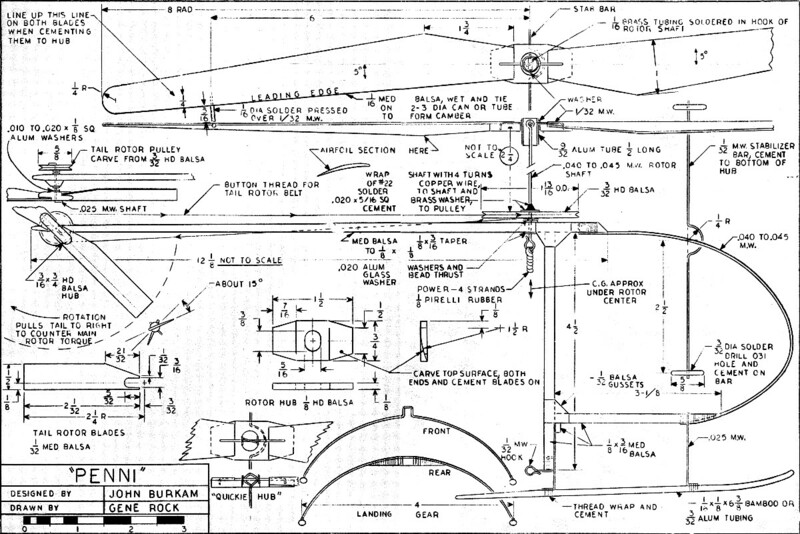 Plans for this fine model were drawn by John Burkam and Gene Rock. All copyrights (if any) are hereby acknowledged. I do not expect and will not accept payment - this is purely a humanitarian service for the modeler who is desperate for plans for this magnificent helicopter. 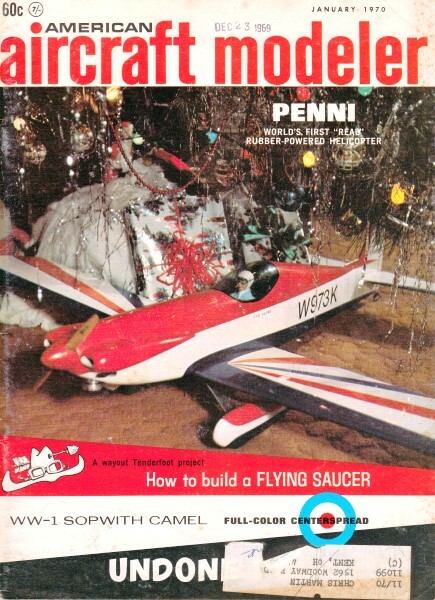 See John Burkam's article "Designing RC Helicopters" in the March 1971 issue of American Aircraft Modeler. World's first, real, rubber-powered copter is simple but a scientifically developed free-flight demonstrating all principles of rotor-wing operation. Build it from scrap! Many men came to me after I flew Penni in the auditorium at the DC/RC Symposium last May and quoted their sons as saying, "Daddy, make me one of those, please!" It is rather cute flying around like a real chopper and it's fairly easy to make - especially if you use the "quickie" hubs instead of the universal hub. Most of you can build it from the plans only, referring to the text in case it doesn't fly right away. This little model was designed during my lunch periods at work and mostly built there, too. She was made specifically as a stability or instability demonstrator for the DC/RC Symposium in May 1969. Big enough to have decent performance, but not big enough to be damaged when colliding with tables, lamps, etc. If you build the universal hub you can press in balsa plugs or wedges to prevent tilting of the aluminum tub with respect to the shaft and/or the hub: You can demonstrate the stability of the completely free universal hub with stabilizer bar and of the feathering-only hub with. stabilizer bar. (Feathering is pitch changing of both blades, one up, one down, about the hinge axis which is nearly parallel to the blades.) You can also demonstrate instability of a completely rigid rotor; that is, no feathering or teetering, and of a teetering-only rotor. If you don't want to experiment you can just build the "quickie" hub shown and have a model that flies just as well as or better than the universal hub. You'll notice that on the quickie hub the blades can feather easily by twisting the feathering pin in the diamond eye, but when the rubber is wound up and driving the rotor, the force of the eye on the feathering pin creates friction to resist any up and down sliding of the pin in the eye, as would be caused by flapping or teetering motion of the blades. This friction damping of flapping motion prevents the fuselage from swinging to and fro like the one with the universal joint. Fuselage: You can start building any part, but I like to start with the fuselage (sticks) and add the landing gear so it can stand up by itself. You can add parts to that and not have them lying around loose, or lost. 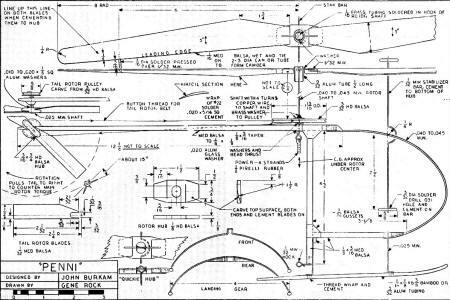 Cut the ⅛ x 3/16" pieces to length and shape the ends as shown on the drawing, taper the tail boom, and sand off rough edges. Mark on the balsa where they come together, then cement them together at right angles to each other. (I recommend Titebond for wood-to-wood joints and Duco cement for metal-to-wood except where solder is called for. Epoxy also is good but is more trouble.) Glue on the 1/32 sheet balsa gussets. Form the .045 wire nose piece, force the ends into the balsa sticks, wrap with thread, and cover the joints with Duco cement. Bend the landing gear struts from .025 music wire (.031 is ok if you can't get .025). The landing skids can be made of bamboo or 3/32 aluminum tubing, or ⅛ sq. hard balsa. If you get a 12" piece of aluminum tubing, r cut it into two 6" pieces and make the skids a little shorter on each end than shown on the drawing. Bind the rear strut to a curved piece of 'Is hard balsa and cement it to the fuselage after cutting a small notch for the wire to fit up into. Press the front strut down onto the fuselage, bind with thread, and cement. After the struts dry in an approximately straight position you can tie on the skids. Here is where you find out why the front strut ends bend forward and the rear strut ends bend backward. Put marks on the skids where the struts are to be fastened. Hold a skid in about the right position and wrap a rubber-band tightly around where one strut touches the skid. Now wrap thread around the other strut and skid. Remove the rubber band and wrap the first strut and skid. Do the other skid same way, line up both skids, and cement with Duco. Now she sits on her feet. Hook, rotor shaft, pulleys: Bend a small hook as shown and glue it on the bottom of the motor-stick. Get thin aluminum (.010 to .020) or find an aluminum beer can. Even a thin tin can will do. This is for washers. Cut two washers rectangularly, ⅛ x ¼, and drill a hole in the center of each just a hair bigger than the size wire used for a rotor shaft. Heart of a copter is rotor-head assembly. The more complicated universal hub is shown. A pin, left in photo, goes through the hub and little tube on the rotor shaft below. Note how stabilizer bar bends around hub. It controls individual blade angle of attack. If you don't have drills that size make one or two out of music wire. File the end flat like a tiny screwdriver then bevel the end at an angle on each side, coming to a point in the center so it looks like the end of a regular drill except for no twisted flutes. If you're drilling tin-can steel, a needle sharpened like a drill holds up better. And" if your hand-drill or electric drill won't take that small size, solder a piece of 1/16 brass tubing, or rolled-up tinplate, on the back end of your homemade drill. This drill, being so small, should be long enough only to stick out of the chuck ¼" or less. You could also use an X-acto pin vise and twirl it between your fingers. Drill a hole down through the fuselage stick for the rotor shaft. If it leans to the left a little, say three or four degrees, OK. That will tilt the rotor to the left and offset the thrust to' the right of the tail rotor. This is not really important. Now stick a piece of rotor shaft wire through the hole and glue on the bearing plate washers just made. Pull that wire out before it gets stuck in permanently, cut off a piece 3112" long, and bend either a diamond-shaped eye in the end for the "quickie" type hub, or a round eye to fit over the 1/16 brass tubing of the universal hub. Cut a 5/16 sq. piece of thin brass or tin plate. Punch or drill a hole in the center of the brass, slip it up on the rotor shaft to a point 2¼" below the center of the eye. Clamp the bottom half in a vise so that the square washer is held at the right place and perpendicular to the shaft. Using soldering paste, solder it securely there, because this washer takes the full tension of the rubber, and full torque while you're holding it by the pulley and feeding the tail rotor belt onto the tail rotor pulleys. Clean off all traces of soldering paste to prevent rust. Draw circles on 3/32 hard balsa the size of the two pulleys. Cut out these circles with sharp knife or razor blade and sand them to smooth circles. Drill a hole in the exact center of each, the size of the wire that goes through it. Take out the drill, slip the pulley blank on it and twirl it to make sure it isn't eccentric. It must be in the center! To make the groove around the edge of each pulley, start by cutting a small 1/32-wide V-groove around the center of the pulley's edge. Be careful not to cut too deeply. Next go around the edge again starting from a point about 1/64" from the edge and cutting toward the center. When you get an even 60-degree V-groove all around the edge, fold a piece of fine sandpaper and sand the groove with the folded edge. Dope and sand the groove a couple of times, so that there is a smooth, hard groove that the thread won't climb out of even when winding the rotor by hand. Tail rotor spins several times faster than main rotor. It has fixed pitch only. Slip the big pulley on the bottom end of the rotor shaft and cement it to the 5/16 sq. washer. Cement another washer on the bottom of the pulley. Before the cement dries, twirl the shaft in your fingers and, if necessary, force the pulley perpendicular to the shaft. Cut out the three balsa pieces for -the tail rotor. Slip on another tiny washer, or a glass bead, add a little Vaseline or Lubriplate, and slip the shaft into the fuselage main bearing hole. To bend the hook on the wire without wrecking the fuselage, hold the wire in long-nose pliers, then bend the wire around those pliers with another pair of pliers. Start with the outermost bend and work back to the middle. You will have to guess how long it should be before bending. This method avoids putting any force on the balsa wood. Tail Rotor: Finish the tail rotor before you lose the pieces. Drill a hole in the 3/16 round piece for the tail-rotor shaft. Carve or sand a slight lifting airfoil shape into the tail rotor blades and glue them onto the 3/16 round hub piece at about 20 degrees to the plane of rotation. This is a left-hand prop, because it is pulling the tail to the right when the bottom end is going aft, (rotation as shown on the drawing). Again, stick a piece of straight wire in the tail rotor hub and twirl it between your fingers slowly, to see if the blade angles are equal and the the blades track or run true without a wobble. Make adjustments while the glue is drying, then add a little more glue to make sure. Glue a little block of ⅛ sq. balsa to the right side of the tail boom where the tail rotor shaft is to go. Drill through for the tail rotor shaft and glue a washer on each side for bearings as you did for the main rotor shaft. After the glue is dry, take a piece of music wire the same size as the tail rotor shaft and clean out the hole so the tail rotor turns easily. Your own friendly copter is ready-to-sly. Paper used for drawing is functional. Now cut a piece of music wire for the tail rotor shaft, 1" long, and bend ⅛" of the end at a right angle. Push it through the tail rotor hub, sinking the bent end partly into the hub. Glue that end and also glue a washer on the other side. Assemble the tail rotor on to the tail boom; stick the shaft through the hole, put on a glass bead or very small washer, lubricate, add a ⅛ sq. washer, then the tail rotor pulley. Enough wire should be sticking thru to bend ⅛" of it over by the two-pliers method without wrecking the pulley. Then slide the pulley out against the bent-over end, cement the wire on both sides of the pulley and slide the ⅛ sq. washer against the fresh cement on the pulley. Blow on the tail rotor to make sure it spins freely, and that the tail rotor pulley runs true. Balance the tail rotor by adding a little Titebond cement to the lighter blade tip. Main rotor: Cut out the blade blanks, soak them in water and tape them to a metal, cardboard or glass cylinder 2 to 3" in diameter. Leading edges should be parallel to the axis of the cylinder. Lay a piece of cardboard over the blades and wrap tightly with rubber or string. The cardboard may not let the balsa dry as fast, but it prevents the string from creasing the balsa. Layout the hub, cut to shape, carve the top sides of the ends to fit the underside of the blades, and drill out the oval center hole with sharpened end of 5/16 tubing. Carve and sand the blades to a nice undercambered airfoil, using the can or tube they were formed on as an aid in holding them. Cement the blades to the hub, using a light line ¼" back of the leading edge to sight across, to make sure the blades are directly opposite each other. Balance the blades on a knife edge crosswise at the center of the hub, either sanding on the heavy blade or adding a little Titebond to the tip of the light blade. Cut a ½" long piece of 9/32 aluminum tubing and drill two holes through it at right angles to each other, and at right angles to the centerline of the tube. These 1/32 holes are 3/32 from the end of the tube. Cut and bend the two L-shaped feathering pins from 1/32 music wire and force the short end down through the blade into the hub, so that the long end projects about 1/16 into the oval hole in the hub. Note that these pins are on the centerline of the hub but that the blade leading edges are swept five degrees forward of the centerline of the hub. This is important, especially if you want to lock out the flapping bearing and fly it as a "hinge less" rotor. Now lift off the feathering pins, slip a small washer over each one and replace . them with the 9/32 aluminum tube in position. Cement the feathering pins to the hub. Cut a piece of 1/16 brass tubing just short enough to fit crosswise in the 9/32 tubing. Solder the brass tubing in the eye of the rotor shaft, centered up and perpendicular to the shaft. Cut a piece of 1/32 music wire 5/16 long and assemble the rotor to the shaft. If the feathering pins project too far into the center of the 9/32 tube and hit the eye of the rotor shaft, file them off a little. Of course, there should not be too much solder on the tube and eye. A small drop of cement on each end of the 5/16-long music wire, where it sticks through the aluminum tube, holds it in place. Bend the stabilizer bar and cement it, less weights, to the bottom of the rotor hub. Make the two weights of equal size from 3/32 resin-core solder or just use Du-Bro Dura-collars with 1/16 bore. If you want to be neat put a bushing of 1/16 aluminum tubing in each collar so it fits the stabilizer bar better. Slip the weights on the ends of the bar and see if it balances. Move one weight in toward the hub a little if necessary. Cement or tighten in position. Whichever blade is high, bend up the stabilizer bar which comes before that blade. Also, if necessary, bend down the bar which comes before the low blade. If you can't get them to track, or if they are very sensitive to a small amount of bending of bar, then add the tip weights, being careful to keep the blades balanced span wise. Last, tie the tail rotor belt (button thread) in position fairly tight. The tightness is not necessary to keep it from slipping, but to keep it from climbing off the pulleys while hand-winding. Use a square knot and cement it after you have it tight enough. Work the cement in with your fingers and remove I any excess. Lubricating the rubber with purchased lubricant (or a 50-50 mixture of glycerin and tincture of green soap) gets more power out of the rubber and allows more turns to be put in. If you want to build the quickie hub, make one long feathering pin instead of the two L-shaped pins. Put two washers in the center of this, push the bent-down ends into the hub, and cement it there. Push' the washers out to where they touch the balsa and cement them there, Now, the diamond-shaped eye at the top end of the rotor shaft should just take up the space between the washers when it is assembled and in driving position. Flying: The CG of the model should come under the center of the rotor. When you launch the model, let go of the rotor first, then a second later release the fuselage. If you want it to rise straight up launch it level. If you want it to fly forward, tilt it forward about 10 degrees. If the tail-rotor thrust is too great for the torque of the main rotor (turns left while hovering) cut a little area off the tail rotor blade tips. If it turns right while hovering, increase the tail rotor blade angle, after making sure that the belt is not slipping. The AMA Plans Service offers a full-size version of plans at a very reasonable cost. They will scale the plans any size for you. Try out my Scale Calculator for Model Airplane Plans.